That is a BOLD wallpaper. I like it! For those interested, you can paint the exterior (only) of any clawfoot tub with a standard latex interior house paint. Wow, that's cool! Thanks for that tidbit! Where do you find claw foot tub faucets with hand held shower? LOOK ON eBAY,THERE ARE SOME. WHEN YOU LOOK, I AM LOOKING FOR AN ANTIQUE SLIPPER CAST IRON FOOTED TUB. Found one and is installed . . . thanks! Love the bathtab. Where can I buy one ? What are its dimensions? How much does it cost? The bathtub looks like a standard "rolled rim" clawfoot tub with ball and claw feet. This one is probably somewhere around a 55" inch length, but we offer them all the way up to 67" inches. Where did you get the silver side table and what are its dimensions? Nicely done... - We are thinking of doing something similar, but how do you clean behind the tub? Did you refinish the but? What type of paint (special typeand color used on the RED bathtub? Could you tell me the name/maker of the paper. Love it! Thank you! - Could you tell me the name/maker of the paper. Love it! Thank you! 5. Don't let a small space stop you from going big with design. This red wallpaper and clawfoot are totally unexpected and lend scads of personality to this bathroom. I love this red! Flowers are a nice touch in the bathroom, too. They add cheer anywhere. Lower the lights, light a scented candle, turn on your favorite music and enjoy a nice relaxing soak. Don't forget your favorite book of poetry. While technically not a powder bathroom, how could I not include this bathroom? Red is an unusual color for a bathroom and this design is a fun example of how bright colors can be used in these rooms. To translate this look to a powder bathroom the red toile wallpaper would be perfect paired with a red vanity. One reason this design works is how the white wainscoting provides relief from the color and brings in the balance and simplicity needed to make all this color and pattern work together. Debbie Snider added this to Will a Red Bathroom Make You Blush? 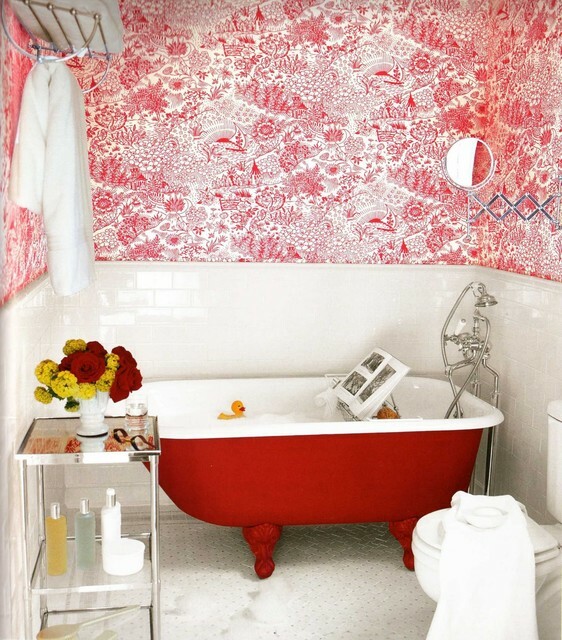 This favorite houzz photo features a vintage style red tub and red and white wall paper. Tip: To temper the heat of red, pair it with a good dose of white. I am in love with this small bathroom, which becomes an absolute jewel with the red wallpaper and matching claw-foot tub. Feeling really adventurous? Give a guest bathroom a jolt by painting the outside of a claw-foot tub and repeating the shade in the wall treatment. If your resident colorphobe panics, just keep the door closed, then bask in the compliments on your daring that will pour forth from visitors. I've fallen hard for vintage claw-foot tubs in fun hues. This charming red toile wall covering is another great way to bring color into the room. This is a popular image on Houzz for a reason: It’s a bold bathroom that’s also big on charm. Red is an intense color, and there’s quite a bit of it in this room, but there’s also plenty of white to lighten things up. I think the vintage vibe of the wall covering and fixtures also helps keep the look whimsical. what about a red tub, black chandelier, and then doing the high up lace curtain? Red wallpaper with matching tub.